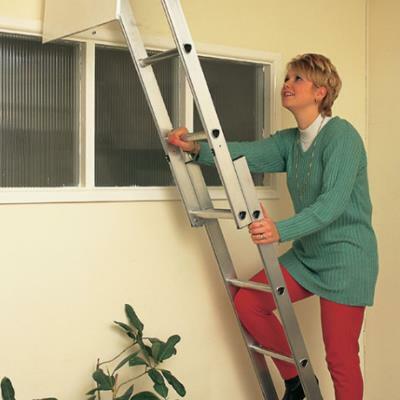 An insulated plastic hinged loft access hatch and frame set to provide simple, easy access through ceilings into the loft space. A loft door with zero air leakage at Part L's 50 Pa - under positive test conditions. 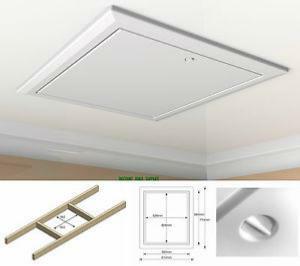 Featuring an integral anti-draught, vapour and condensation migration seal with a insulation U value performances of 0.35 W/m2k. Simple twist operated catch release with secure key lock option. *air permeability measured at 50Pa as 0.00m3(h.m2) under positive pressure test conditions. Designed to fit between 38mm thick trussed rafters or ceiling joists spaced 600mm centres which provide a clear joist opening width of 562mm. Clean simple design that will blend well with most surrounding decors; with slightly textured finish that can be painted if required. 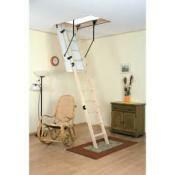 Concealed downward opening hinge mechanism allows use with telescopic loft ladder systems.